RIJKS is a 140-seat restaurant headed by executive chef Joris Bijdendijk and his right-hand men Jos Timmer and Wim de Beer, three chefs who have worked in some of the best kitchens in the Dutch capital. Joris Bijdendijk (b. 1984) made his mark on the Amsterdam dining scene as executive chef of Bridges at The Grand Hotel. 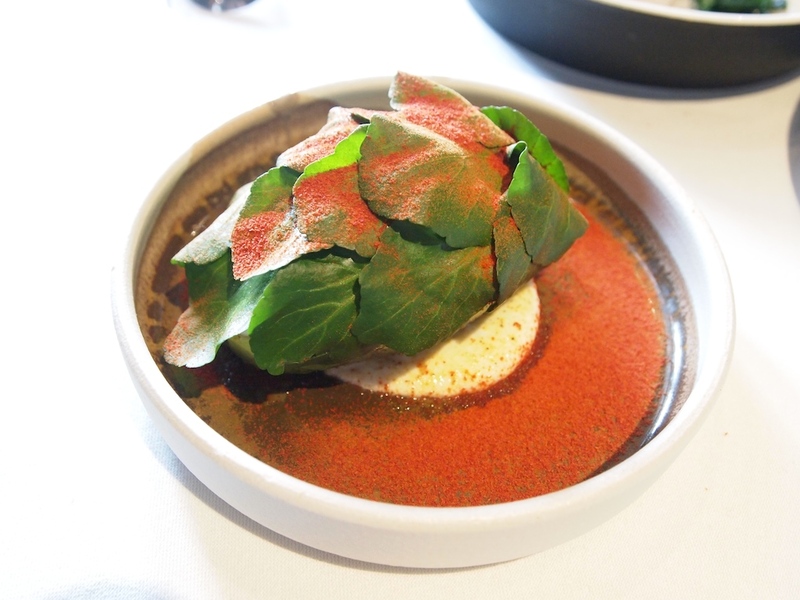 Bridges was awarded a MIchelin star in the 2014 guide, about one year after the opening. Bijdendijk also trained at the Ron Blaauw restaurant in Amsterdam (then 2 Michelin stars) and the Michelin starred Le Jardin des Sens in Montpellier (Jacques and Laurent Pourcel). 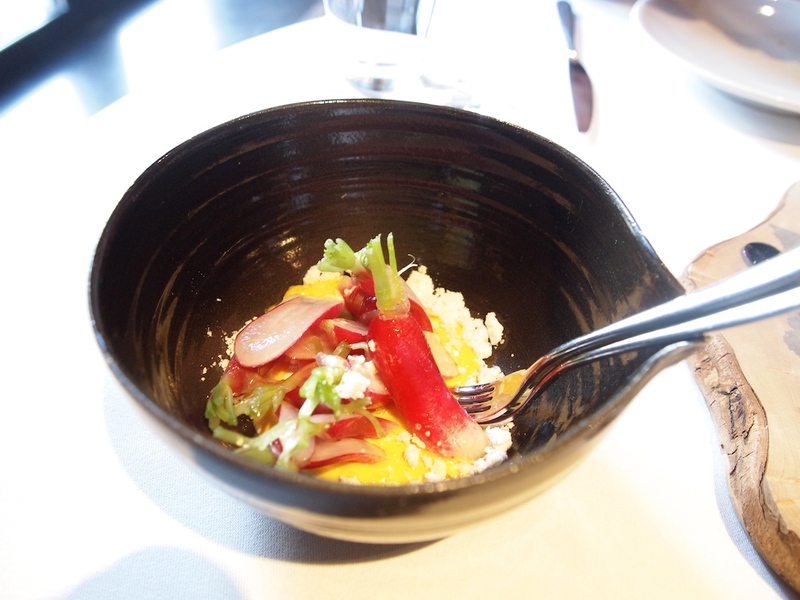 The modern Dutch menu at RIJKS offers 'cold' and 'hot' dishes (cold �13 - �20, hot �12 - �34), designed for sharing. Desserts are priced at �9 and cheese at �11. You can also order a so-called 'Rijkstafel' (usually around 5 dishes for �47.50), described on the menu as "a table full of dishes" and comparable to the Dutch-Indonesian 'Rijsttafel'. RIJKS is open daily for lunch and dinner. I had lunch with my husband at RIJKS a week after the opening on 8 November 2014 (on which occasion we ordered the Rijkstafel) and again on Saturday 6 December 2014. On the last visit we ordered a number of 'cold' and 'hot' dishes. * I was recognised both times. 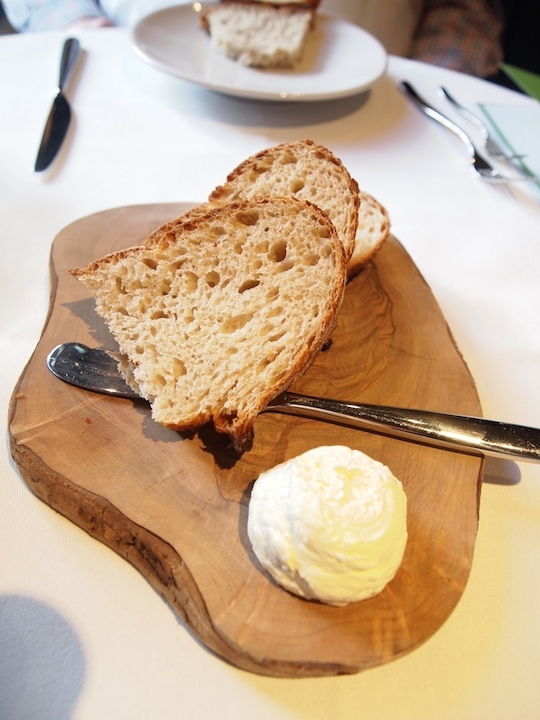 First to arrive was some bread served with whipped butter and a bowl with crunchy radishes, a nice and sharp piccalilli cr�me and olive 'snow'. A delicious start. This was followed by the first dish of the cold section on the menu. Two gigantic, lightly poached oysters, served with an oyster and black fermented bean sauce/vinaigrette, thinly sliced ginger and shredded spring onions. 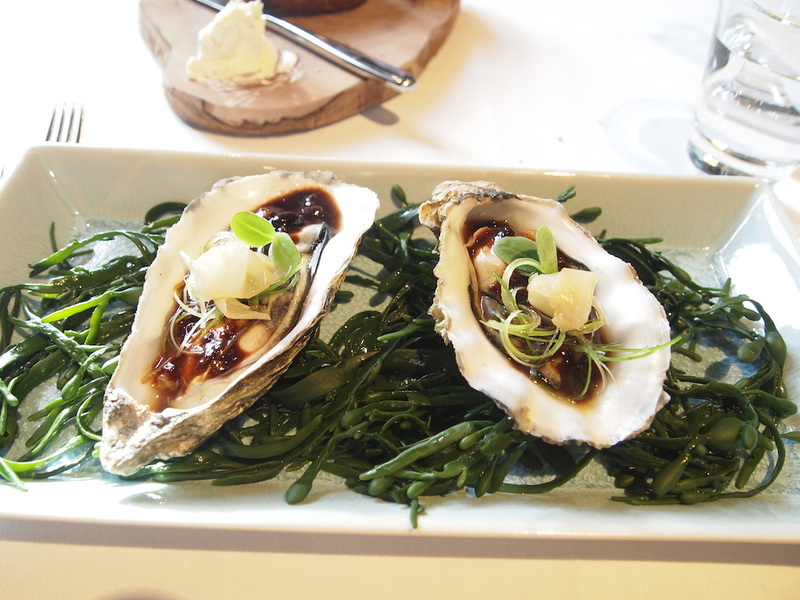 The oysters were juicy and springy and the sweet and salty sauce complemented them wonderfully. Lovely aroma from the bed of seaweed on which the oysters were presented. The next three dishes from the cold menu were served in one go. 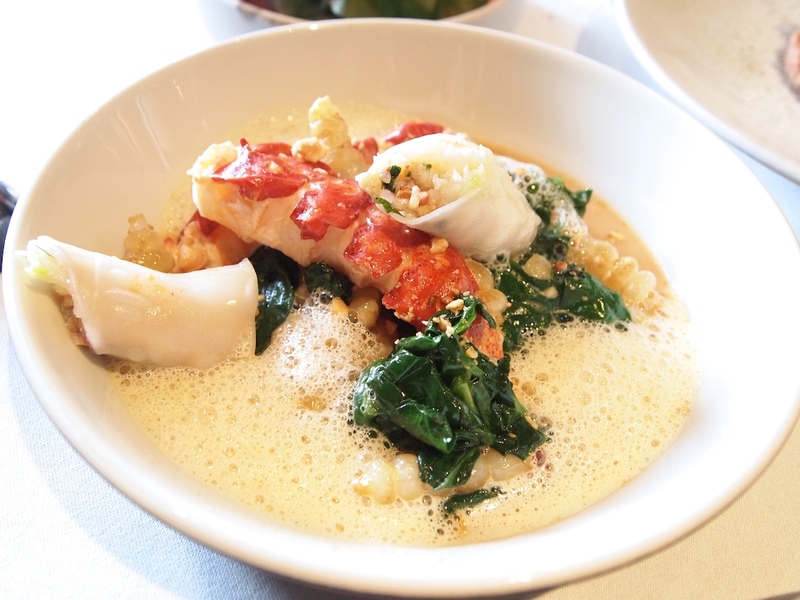 First up was a fragrant dish of superbly cooked, succulent lobster tail, served with a bisque, a shellfish and coconut foam, wilted spinach, some crunchy crosnes (a type of root vegetable) and a (cold) lobster, daikon and peanut salad, wrapped in rice paper. A wonderful dish with a great interplay of flavours, textures and temperatures. The fantastic, intense, bisque had been flavoured with Tom Kha Kai and had lovely caramel-like flavours and elegant heat. Equally good was the lobster roll, which had well-balanced fresh flavours, the peanuts adding crunch and saltiness. This was followed by a lightly marinated avocado half, placed on top of some strained goat's yoghurt, that had been flavoured with almond milk. On top of the avocado was a mixture of pearl barley, finely chopped celery, celeriac, and tomato, which mixture was covered with sorrel leaves. The dish was finished with a dusting of concentrated tomato powder. A very pleasing combination of flavours with a wonderful textural contrast. There's the grassy, delicate creaminess of the avocado, then the clean flavours and bite from the pearl barley mixture, followed by the mild sharpness of the strained yogurt and finally there's the warmth and bittersweetness of the tomato powder. The pearl barley mixture had been delicately seasoned with salted lemon and coriander, the former delivering a nice touch of complexity. 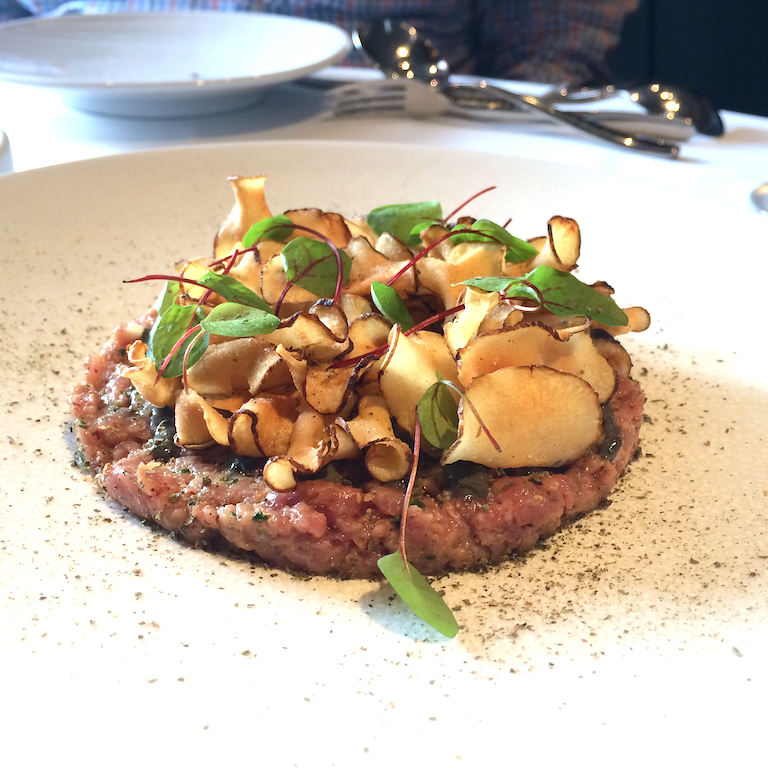 The third dish was an elegantly presented Gascon veal tartare, seasoned with parsley, chives and apple, and spiced up with some salty sprats and Jerusalem artichoke crisps. Also on the plate was some dried caper powder, which complemented the veal tartare perfectly. A delicious veal tartare with spot-on seasoning and the caper powder was a nice, creative touch. Lunch continued with four warm dishes. 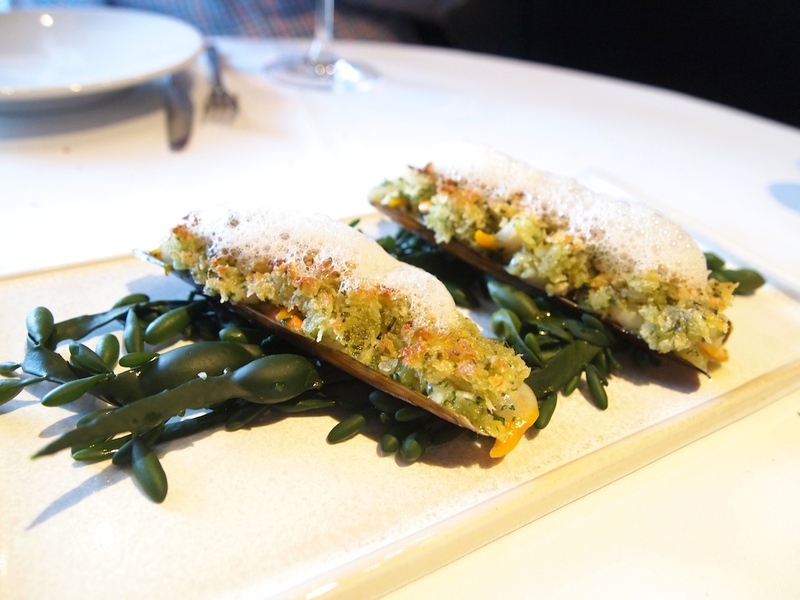 To start there were razor clam shells with a mussel, clam and razor clam filling, flavoured with garlic, parsley, tarragon, chervil and some salted lemon. The tender shellfish was covered with a buttery panko bread crumb and 'Amsterdamse uien' (sweet pickled baby onions) mixture and finished with a light shellfish foam. A lovely dish with gutsy but balanced flavours and a nice long aftertaste. Well-judged use of salted lemon too. Braised feather blade steak 'zoervleisj' style followed. Zoervleisj, or sour meat, is a traditional Limburgian beef stew, generally made with vinegar, spiced cake and (apple) molasses, and often served with roast potatoes or chips. 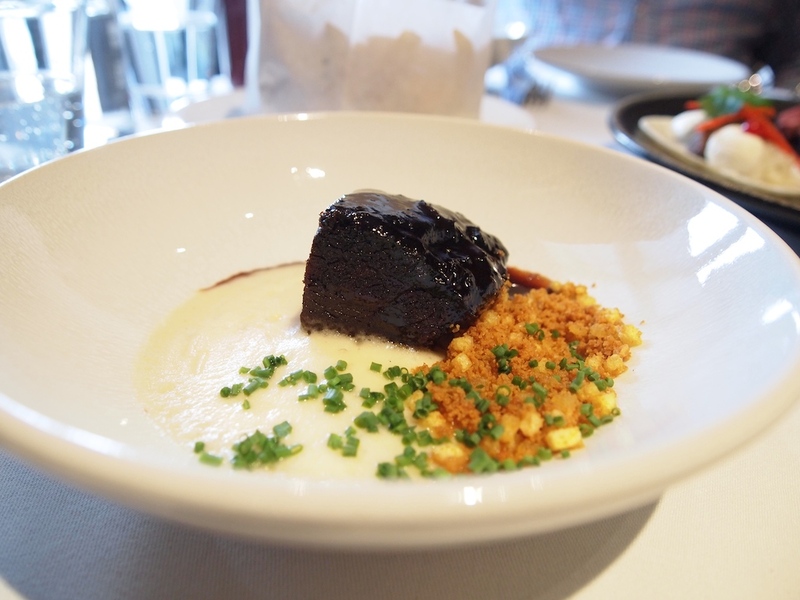 In this case a shiny chunk of rich and tender beef was succesfully paired with a creamy and sharp apple cream and some crunchy potatoes and spiced crumbs. The apple cream combined well with the beef and its sweet freshness balanced the richness. Next up were wild duck pancakes. Beautifully cooked duck breast and a duck leg and cornelian cherry stew, served with thin and moist pancakes, pickled fennel and cr�me crue. The flavoursome and rich duck combined wonderfully with the mildy tangy cr�me crue and the tart cornelian cherries, which made for a knock-out dish. After experiencing this flavour combination for the first time at lunch in November 2014, I ordered second helpings instantly and I have to say I was very tempted to do so again. Last in line was rotisserie celeriac. 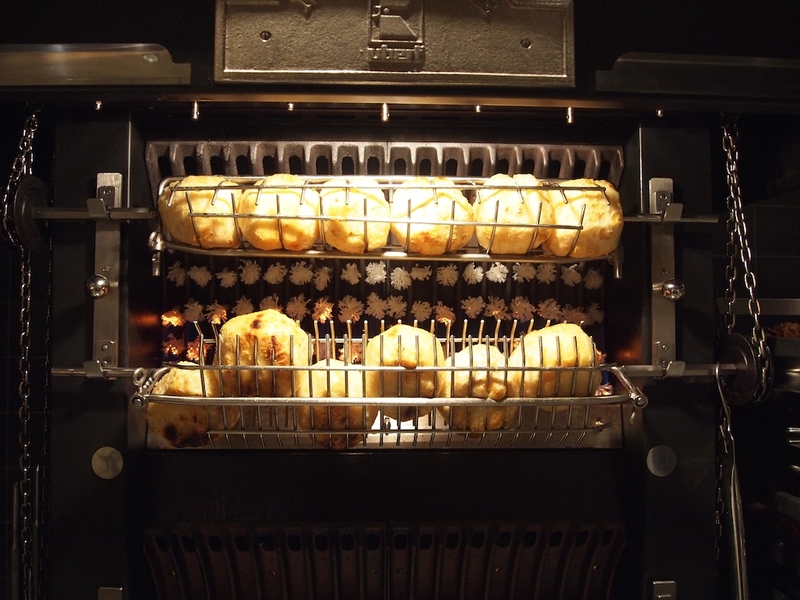 The restaurant's rotisserie is used for chickens and celeriacs. First the celeriac ist steamed for one hour at 100�C; then the celeriac is covered with butter, skewered on a spit, and roasted for 2 to 3 hours. The end result is deliciously tender and sweet celeriac served with some soft and mildy sharp Dutch Messeklever cheese and some ground almond dust. A very pleasing combination of flavours and textures. The roasting had intensified the charasteric flavours of the celeriac and also added a lovely touch of caramel nuttiness, which was lovely. I was served a half portion of this dish, which I think worked better than the full portion I had on my first visit. The flavours in this dish are distinct and powerful, so a full portion can be quite a mouthful. 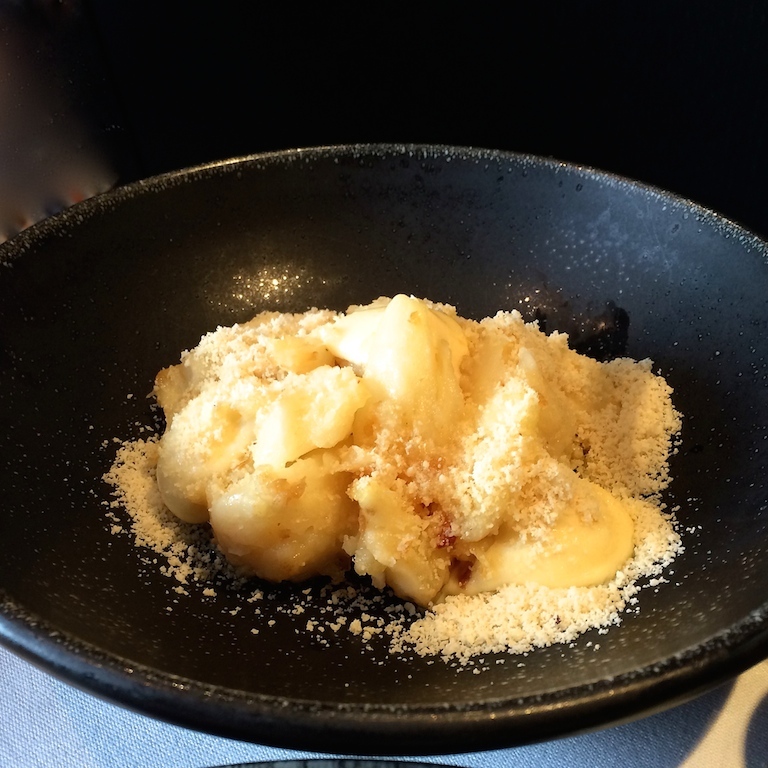 Dessert was based on the flavours of a classic apple pie. There was a green apple mousse sphere with an apple compote centre, covered with pieces of 'kletskop' (caramelised almond snaps), served with a smooth cinnamon ice cream and some buttery crumbs. An attractive dessert with a lovely balance between sweetness and sharpness, and the ice cream had good, intense cinnamon flavours. Situated right in the middle of the Museumplein ("Museum Square") in Amsterdam, restaurant RIJKS enjoys an enviable location that will attract many tourists and locals alike. Catering to the desires of both, is quite a balancing act that the fledgling RIJKS seems to perform admirably so far. In many ways, this restaurant is a new feature on the Dutch dining scene. Dutch museum restaurants tend to serve coffee and sandwiches, but RIJKS is something very different. When he was appointed in 2008, the new Rijksmuseum director Wim Pijbes already made it clear that he had high ambitions for the new restaurant of the museum - in fact he indicated that he wanted to create a restaurant that might potentially even obtain a Michelin star. No corners were cut during the refurbishment of the Rijksmuseum and no corners were cut at RIJKS. They wanted to make sure that everything was up to scratch and true to theme and they did a good job. The menu is designed to showcase Dutch ingredients and Dutch recipes, but it also leaves room for dishes with a more international character. The earthenware in the restaurant is made from Amsterdam clay and the board on which the steak is served, is made from a tree felled in the Paulus Potter street - just metres away from the restaurant. The wine list is comprised of wines made by peripatetic Dutch winemakers. It is only apt that Dutchness should abound in the restaurant of the Dutch national gallery. Fortunately, the cooking at RIJKS lives up to its billing too. The restaurant has an ambitious young team behind the stoves, so I was expecting great things and I wasn't let down. 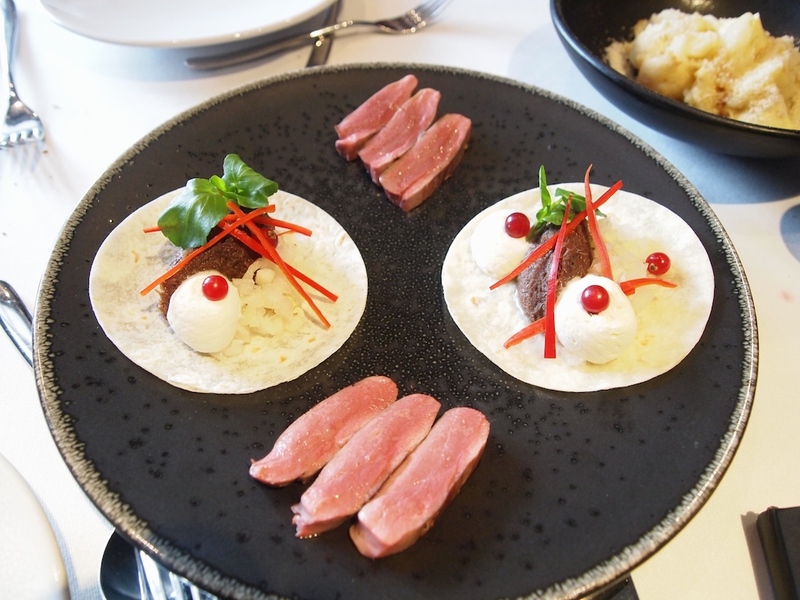 It is wonderful to see a rustic and traditional dish like 'Zoervleisj' being transformed into something quite sophisticated and the duck pancakes and the veal tartare were particularly seductive. 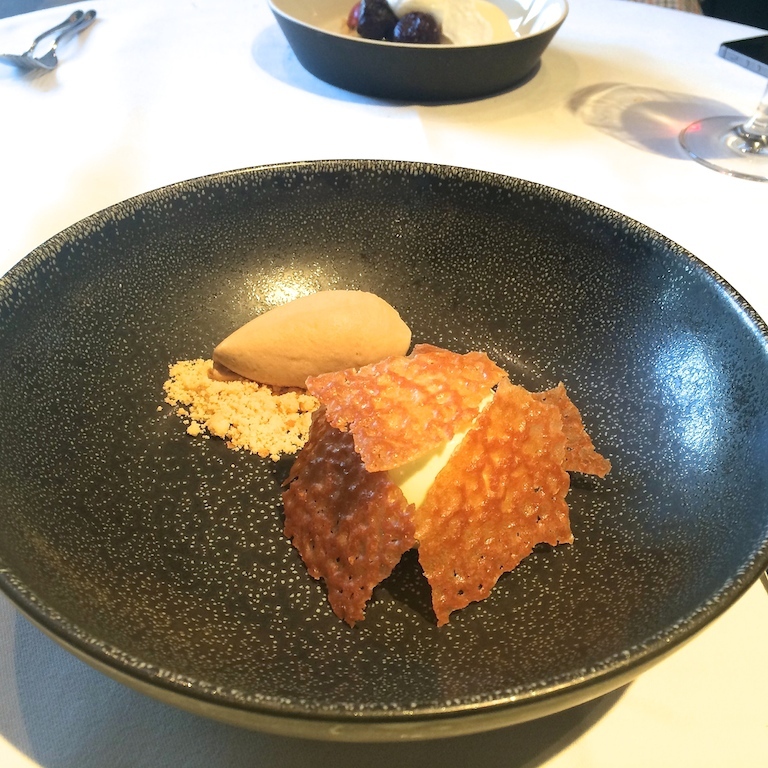 Admittedly, I wasn't too keen on Joris Bijdendijk's cooking at restaurant Bridges, but he seems to have taken to his new restaurant like a duck takes to water. The only thing that may need some consideration is the way in which the food is served. At the moment the dishes are served in groups of 2 or 3 dishes, similar to Asian restaurants, but I'm not entirely sure if this approach works for this style of cooking. Potentially it could affect the temperature and texture of the food, if the dishes sit around too long. 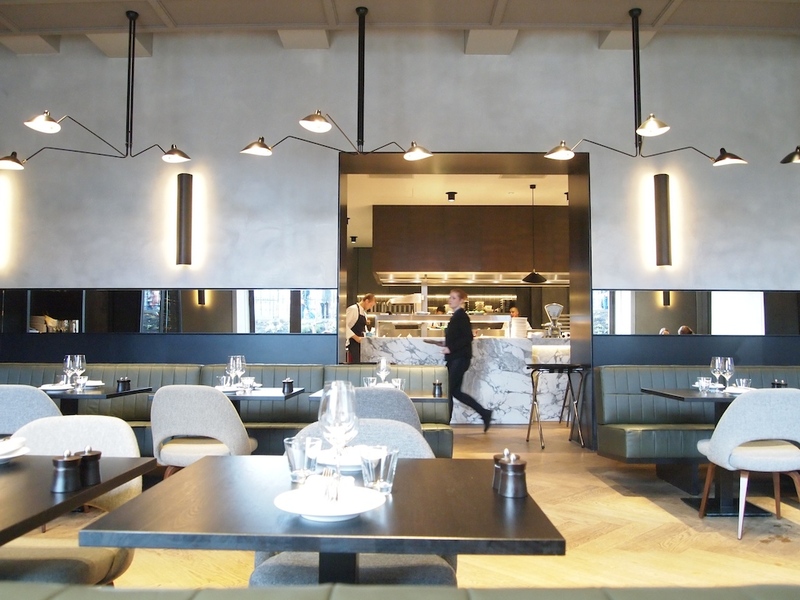 However this may be, with its excellent food, its suave dining room and its cosmopolitan feel, RIJKS is certainly another step forward for the rapidly developing Amsterdam dining scene.